The Vickers E.S.1 was an early British Fighter aircraft of the First World War. A single engined biplane, only three E.S.1s were built, although at least one was used by a home defence squadron of the Royal Flying Corps. In late 1914, Harold Barnwell, chief test pilot with Vickers Limited, designed a single seat "scout" or fast reconnaissance aircraft, and had it built without the knowledge or approval of his employers, "borrowing" a Gnome Monosoupape rotary engine from Vickers' stores to power the aircraft. Barnwell attempted a first flight of his design, named the "Barnwell Bullet" in early 1915, but the aircraft crashed and was wrecked, possibly due to a miscalculated Center of gravity. Now aware of Barnwell's design, Vickers instructed their junior designer Rex Pierson to redesign the Bullet. The redesigned aircraft, the Vickers E.S.1 (Experimental Scout), was a single-engined tractor biplane of fabric covered wooden construction. It had single-bay unstaggered wings with ailerons on both the upper and lower wings. Like the Barnwell Bullet, the E.S.1 was powered by a Monosoupape engine, closely cowled into a circular section fuselage. The pilot's cockpit was situated under the trailing edge of the upper wing, from which the view both downwards and upwards was poor. The E.S.1 first flew in August 1915, and was found to be extremely fast (a speed of 118 mph (190 km/h) was claimed by Vickers), and being capable of gaining height while looping. Following operational trials in France, it was fitted with a modified cowling to allow fuel to drain away from the engine, and was fitted with a forward firing Vickers machine gun with the Vickers-Challenger gun-synchronising gear allowing the gun to fire through the propeller disc. A further two aircraft were built with a modified fuselage and a large cut-out in the upper wing to improve the view for the pilot, and powered by a 110 hp (82 kW) Clerget or Le Rhx�ne engine. These were designated Vickers E.S.1 Mark II., although they were known to the Vickers company as the E.S.2. 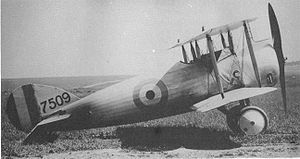 No further production followed, with the aircraft being noted as being tiring to fly and difficult to land, although it did form the basis for the Vickers F.B.19. The unarmed E.S.1 was sent to France for operational trials at Saint-Omer in France in 1916, where it was criticised for the poor view for the pilot and for the fact that if the engine was mishandled, petrol could collect in the cowling and catch fire, and was finally badly damaged in a crash when flown by Captain Patrick Playfair. After rebuilding and arming with a synchronised Vickers gun, the modified E.F.1 Mk I was sent to No. 50 (Home Defence) Squadron. Also sometimes called Vickers E.S.2, although contemporary reports all refer to these aircraft as E.S.1s.